Update: Comments from Sallie Mae below. 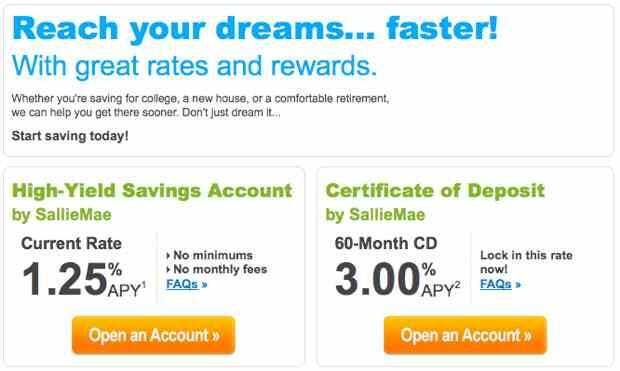 Student loan originator and equally troubled GSE Sallie Mae can’t issue bonds backed by crappy student loans, so it’s come up with another way to raise cash: online savings accounts. Following in the footsteps of GMAC’s Ally Bank, Sallie Mae now has a website at banking.salliemae.com where users can open up a high-yield savings account with 1.25% APY with no minimums or fees. There’s also a 3.00% APY 60-month certificate of deposit, which is pretty darn good considering how tight lending has become in the past few years. Asset Backed Alert reports that Sallie has been relying heavily on brokered deposits for funding.